The first of in the “Attack of Cheap Whiskies” feature, Ancient Age is one of the oldest holdings in the Buffalo Trace stable of brands. As the cheapest in this feature, I acquired it for about $12 U.S. Ancient Age is nearly exactly what you’d expect from a $12 bottle of booze. Let’s be clear here: what are any of us really expecting from a bottle of whiskey that costs no more than a tenner and coins that we scrounged from the sofa? Not much, I’d wager. 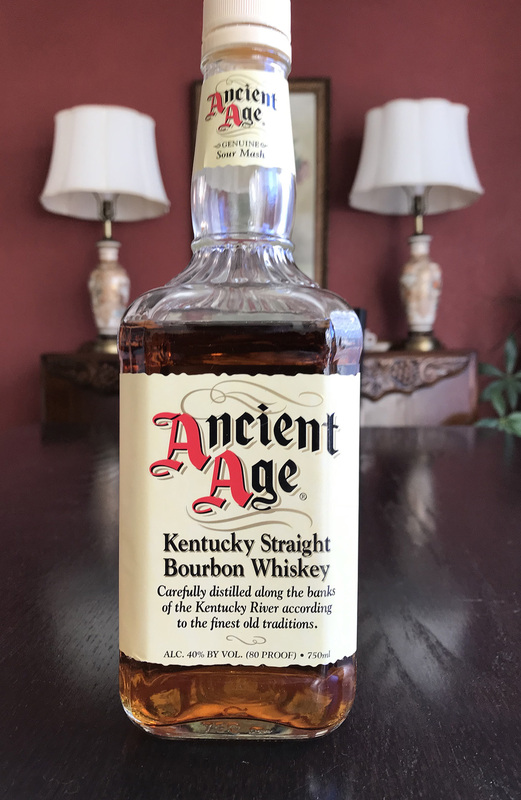 With no age stated but “Kentucky Straight Bourbon Whiskey” proudly emblazoned on the bottle, we know that Ancient Age is at least 2 years old. It has, it turns out, spent about 3 years in a barrel. It also shares the same high-rye (around 15%) mash bill as Blanton’s and Elmer T. Lee. And while I don’t hate either of those whiskies, as my review of Blanton’s will attest, I’m not exactly a fan, either. So, when you take a whiskey I don’t love, and pull it from its barrel years early, what am I going to get? Disappointment. The nose and flavors for Ancient Age nearly perfectly match up. The scent has a twinge of rubbing alcohol behind the subtle toasted wood aromas. The caramel corn and vanilla notes play a backing role here, which is sad because if they were dialed up, this would be a hell of a bargain. Now, as a high-rye bourbon, I’d expect some nice white pepper bite. As a sour mash, I’d expect some depth of flavor and character. Sadly, Ancient Age fails on both of those characteristics. The flavor is a bit flat, showcasing sugar and popcorn with a touch of clove spice. And the consistency here is the exact opposite of viscous. As it comes off watery, Ancient Age doesn’t coat the tongue. The finish is short; leaving nothing on the palatte to beckon you in for another sip. Ancient Age isn’t very smooth. It’s definitely not complex. Despite my notes above, it’s not particularly sweet. If you’re planning on making a twist on Lynchburg Lemonade, I suppose you could use Ancient Age, but your cash is likely better spent elsewhere. Will I be poisoning my body with more Ancient Age? No. Would I recommend that you buy it? No.